As an alternative you may look on Features of Google Map Lite Mode. You may also look for other 8 best alternatives of Google old classic Map. 2.) Click Help icon, which you may find in bottom right corner of map. 3.) Click return to classic old Google map. 4.) 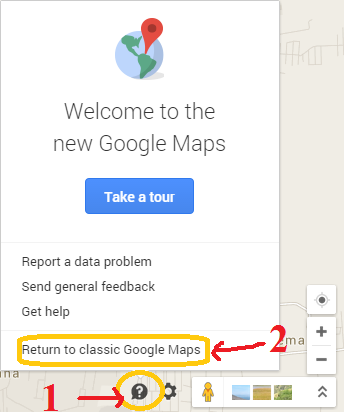 You can write feedback about the new map for the improvement, and again click to revert to classic map, which finally returns you to Google classic old map. 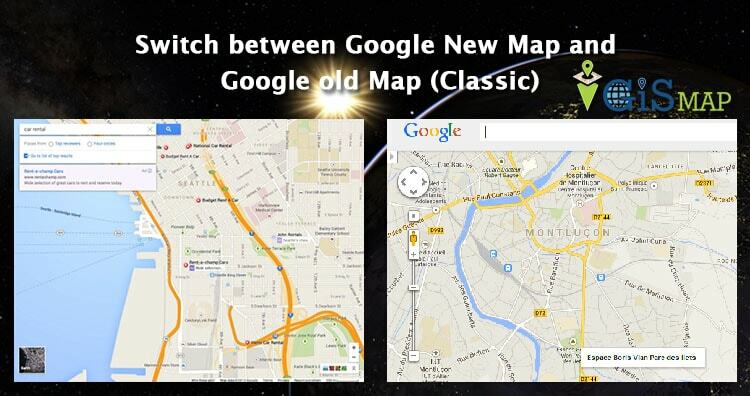 You can also switch back to new version of Google Map. By default when you open up maps.google.com, it will response with new Google map. 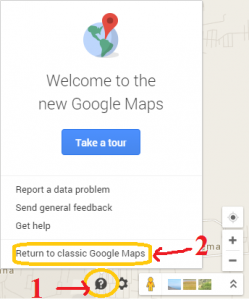 If you getting any problem with Switching back from Google new map to Classic map, do comment below, so that we could discuss and reslove the issue. Thank you. The pc at work is set for default using the classic google maps and I’m having trouble switching to the new one; please advise. Hi Carmela, what’s the problem you are facing? Have you tried the link provided in the post to get back to Google old classic map? Yes, I was able to use old google for a day and then it changed back. I need the search nearby with the miles and the new google map does not have that. I am very disappointed as I need to be able to have that for work. Forget about Google if you want to measure distances. On the webpage, enter the address or place, click on it to open – click ‘measure’ – then choose 1 of the 3 items (selecting whatever you need) – then go to the map, place your cursor at the starting point and continue to your destination. The distance will be shown in the box. You can cancel either by clicking on the map or on the X before starting another. The basemap has 10 (yes 10) types of map options, just select the one you need. The ‘measure’ will even work on the ‘Imagery’ basemaps! If you do get (or have already got) the solution to getting the old google map classic, please do let me know the same. I too miss the classic one. I tried the classic link and the settings also but no success. Only the new version is available. I need the old view!! I can not switch back to the old version of Google Map either. Where is the “Search Nearby” on the new version?? It does not switch to classic Google map. It starts on April 30, 2015. Please fix it. the “upgrade” seems more of a downgrade!!! I wish the old map setting worked!! stupid google changing things. The Google Classic Maps are great, logical, clear, fast, it just works great. Also, the controls are in one, proper place, and easily marked. New maps are cluttered, difficult to navigate, slower. Google should leave old Classic Maps interface on – until they come up with something, well, better. HERE IS THE LINK TO THE OLD CLASSIC MAPS, THIS ONE HAS NOT BEEN UPDATED. They’re the same group of effete a-holes as Yahoo. Better path would be to find a decent alternative that mimics the earlier success of old maps. Hello.i downloaded the new google map app.It’s still a good tool but the google map app.i had before gave me three routes to a given address.the new app guves one.I went to the options but it gave me no alternative route option.How do i get that option? The best option is to download Google Street view App. How do I make Google Maps return all the results like it used to, and not just the first 20? I want to see more than just a tiny sliver of the top results on the map in a big city!